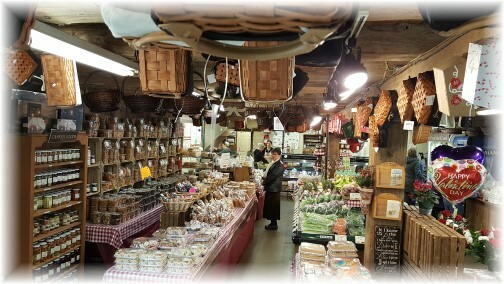 A favorite stopping spot of ours is The Village Farm Market along Route 322 east of Ephrata, PA. It is in the lower portion of a bank barn that had been used for steers till it was converted to a very quaint country store with baskets covering the ceilings. Yesterday we stopped for a sandwich in the course of our chaplain visitation. Message summary: Every one of us has a final appointment. This appointment will take place whether or not we believe in it. An active faith in God is not necessary. This appointment can't be skipped nor forgotten. You can't cancel it or reschedule at your convenience. There will be no excuses accepted. Wealth, position, power or possessions really don't matter when it comes to our final appointment! Today my Dad is celebrating his 98th birthday in heaven. He was born on February 17, 1919 and had his final appointment in 1998 when he transitioned from life here below to his eternal home. It was also on this very date that Brooksyne's father had his final appointment when he passed on in 2000. For my dad, Eugene Clark Weber, February 17 was his "time to be born". For Brooksyne's dad, Brooklyn Nile Sherrell, February 17, was his "time to die". So today holds some special memories in our home. We have appointments all through life. An appointment is simply defined as "an arrangement to meet someone at a particular time and place." Even before we had any recollection or memory our mothers had appointments with us when they were carrying us in their womb, when they were taking us to appointments as infants and children. As we progress through life we have had many appointments: school appointments, doctor appointments, business, community and church appointments and on and on. In fact we have an appointment this morning! Many appointments we can schedule. We have a role in determining when and where and in many cases if we will meet. But we had no role in determining when we were born and, apart from taking our own life (suicide), we have no role in determining when we will die. Every one of us has a final appointment. This appointment will take place whether or not we believe in it. An active faith in God is not necessary. This appointment can't be skipped nor forgotten. You can't cancel it or reschedule at your convenience. There will be no excuses accepted. Wealth, position, power or possessions really don't matter when it comes to our final appointment! The secular reader will smugly smile at this. Although he certainly cannot deny the inevitability of death, he may chuckle at what seems to him the archaic notion of an appointment of future judgment and accounting to God. The believer in Christ and the believer in the worldly system both have faith. Death is the final step of faith for both. One believes the record of the Bible, the other believes the record of "enlightened" man. One has faith that the words expressed in the Scripture are true, the other believes in what man has said. One believes we are uniquely created in the image of God, the other believes we are just a higher form of evolved animal life. One believes that following death there is judgment day with a heaven to gain and a hell to shun. The other believes that we are merely physical matter and at death we simply cease to be (although I find it interesting that at the death of a loved one, all, except for the most ardent secularist, express belief in the after-life). What do you believe today? You do believe one way or the other. There's really no middle ground. I believe in the record of the Bible. I accept its words as truth. And I don't want it to be merely "religious" belief that is compartmentalized but a dynamic, living faith that impacts every area of my life. I believe the main thing in this life is to be ready for that final appointment. I am trusting in Christ and believe I am ready. Are you? Daily prayer: Father, I praise You because I am fearfully and wonderfully made; Your works are wonderful, my soul knows that very well. Your eyes saw my unformed body and yet all the days You ordained for me were written in Your book before one of them came to be. I'm so thankful that wherever I go Your Spirit goes with me. I cannot flee from Your presence nor would I want to since I am protected and guided by Your righteous right hand. I want to be faithful to You and to Your cause all the days of my life until the final appointment when You call me to be with You in heaven. Amen. The daily text is a straightforward acknowledgment of an appointment we all face. Now of course there will be a generation (perhaps our own) who will exit by way of the rapture, but most will leave by way of their appointed death. 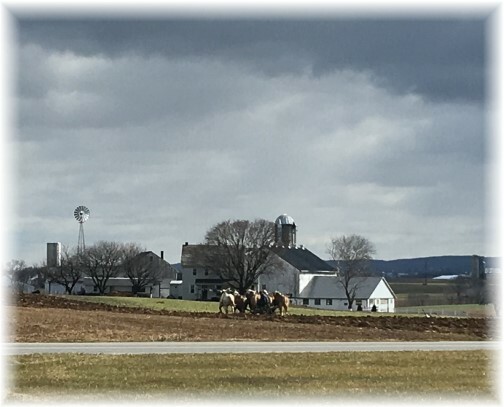 Yesterday was cold and blustery but this hardworking Mennonite farmer was out plowing his field near Martinsdale, PA.